You will get noticed with this awesome design hand stenciled on Jute / Hessian eco friendly bag with no harsh chemicals used in dyes and wide cotton tape handles for your comfort. Please note the colours are reversed on either side ..watch the bag pics closely! This is not a defect but the bag has been designed that way! Made of jute which makes it light weight and strong with an internal pocket for easy access to phone / keys that can be flat packed for easy storage as shown. 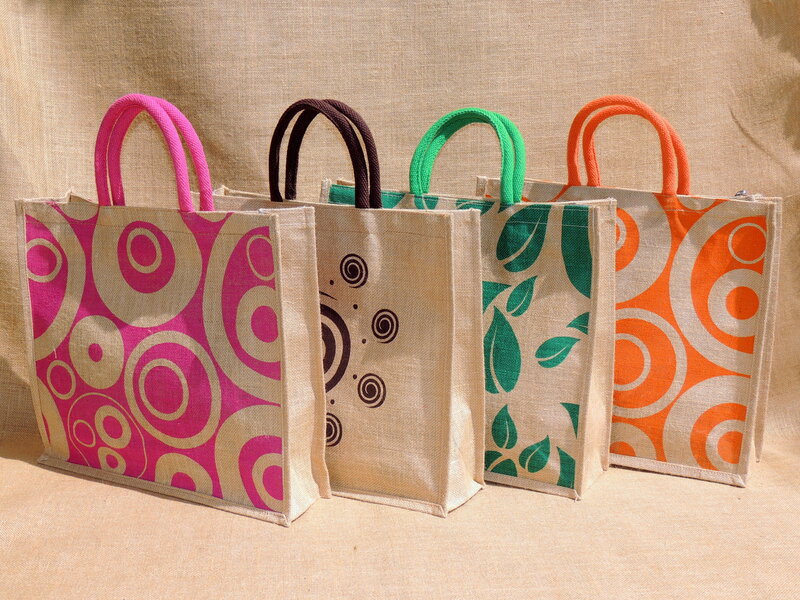 Use it as a shopping bag, tote bag, grocery bag, beach bag, hand bag, lunch bag, library bag, picnic bag.....your pick! Jute Bags For Wedding , Jute Bags For Birthday Functions, Jute Bags For College Conferences, Jute Bags For School Conferences, Jute Bags For Engineering College conferences. Not any other grocery bag....my hand drawn design using black on red....chevron with a twist and later hand screen printed on eco friendly Hessian / Jute by my manufacturer to create this stunning bag! The bag is light and strong. Soft padded cotton handles for better grip and comfort. Internal pocket for easy access to phone / keys with protective inner coating for easy cleaning. No harsh chemicals used in dyes. Print on both sides. Can be used as a shopping bag, grocery bag, market bag, tote bag, gym bag, beach bag, hand bag, lunch bag, library bag, picnic bag and of course your holiday trips as it can be flat packed! Care Instructions - Jute / Hessian is very resistant to dirt and spot clean / gentle sponge to wipe of any marks. The bag has a laminate on the inside and use a wet cloth to clean the inside. Do not wash as colours may run. Using a washing machine and dryer is NOT recommended as the dryer will melt the laminate Jute Bags For Corporate Return Gifts, Jute Bags For wedding , Jute Bags For Birthday Functions. Drawstring closure Easy To Carry Traditional Potli Perfect storage for jewellery Material:jute Bag Size:Small, 1 Pouch Potli Occasion:Festive Casual, Col0ur:golden yellow Disclaimer : Color may slightly be different due to viewer's screen brightness.